Land and forest fires across Indonesia regularly affect air quality in parts of the country, particularly in Sumatra and Kalimantan. "Unhealthy" to "Hazardous" levels have been recorded at times. People with underlying heart and lung disease, elders, babies and children are particularly vulnerable. To reduce the risk of potential health problems, reduce exposure by avoiding time and physical activity undertaken outdoors. Indonesia periodically experiences haze caused by land and forest fires. Follow the advice of authorities. 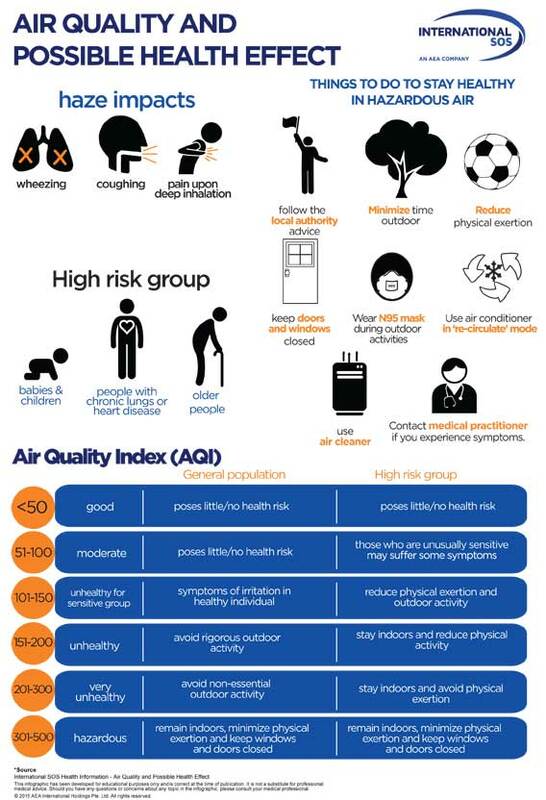 At times when air pollution is above the "unhealthy" range, minimise time and physical activity outdoors. When going outdoors, consider wearing a particulate respirator (N95 mask) and eye protection (sunglasses).